About 10 PM last night, Roosevelt Island residents started hearing VERY, VERY, VERY LOUD MUSIC BLASTING through their apartment windows. Any idea what the loud music is about? Over 100 Roosevelt Island residents called the Roosevelt Island Operating Corp (RIOC) Public Safety Department to find out what was going on and to complain about the excessive noise. THERE IS A CONCERT IN QUEENSBRIDGE PARK WHICH IS CREATING EXCESSIVE NOISE ON ROOSEVELT ISLAND. NYPD HAS BEEN NOTIFIED AND THEY HAVE ADVISED THAT ANY NOISE COMPLAINTS BE DIRECTED TO 311. It turns out Rapper Nas hosted a listening party and live streaming show for his new Kanye West produced album Nasir under the Queensboro Bridge between Vernon B'lvd and the East River next to the Queensbridge Housing projects where he grew up. ... There’s not really much residents can do, besides calling 311. Roosevelt Island Public Safety @RIOCny says Queensbridge concert has permit and nothing PSD can do. Suggests residents call 311. Our windows were shaking to the beat of the bass! 2/ Surreal to hear new @Nas album at listening party in secret location (under Queensbridge) with Havoc (Mobb Deep) + Pusha T + Kanye. Kanye West must like the East River waterfront area. In 2016, he hosted a fashion show at FDR Four Freedoms Park. What's next? 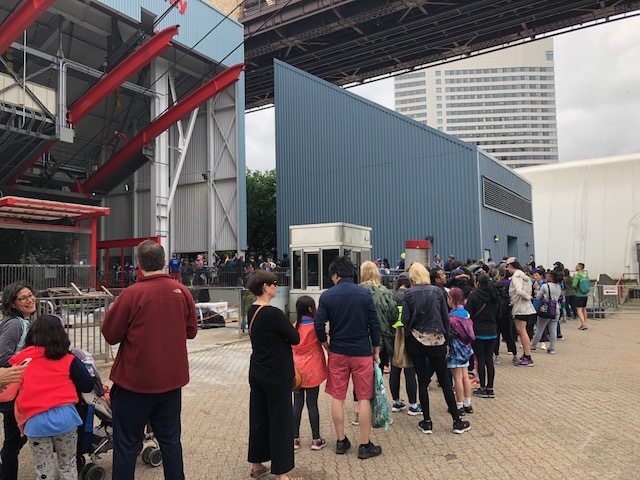 Remember only 1 Roosevelt Island Tram Cabin operating this weekend and for at least 2 more weeks. And no Metro Card Vending Machines working at Roosevelt Island Tram station. Fill up your Metro Card at RI Subway or Tram Manhattan station. 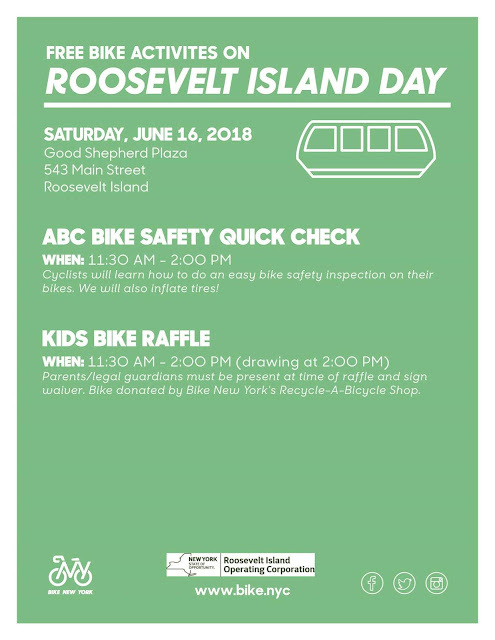 Roosevelt Island Day is this Saturday, June 16th. Come out and continue the tradition of celebrating Roosevelt Island in fine fashion! Starting at 9 AM, Good Shepherd Plaza will be full of volunteers, activities, entertainment, games and so much more! Look out for the petting zoo from 10 AM - 12 PM at the lawn south of Rivercross as well! Don't forget to become a volunteer to get your free Roosevelt Island Day t-shirt! Go to http://signup.com/go/opyuzLp to sign up or check in at the RI Garden Club or Clean-up Crew tables between 9 AM - 12 PM this Saturday. We are also very excited to welcome The Funktion- a funk, soul cover band- to bring the party to the Plaza from 6 PM - 8 PM. Don’t miss out on a day full of fun! 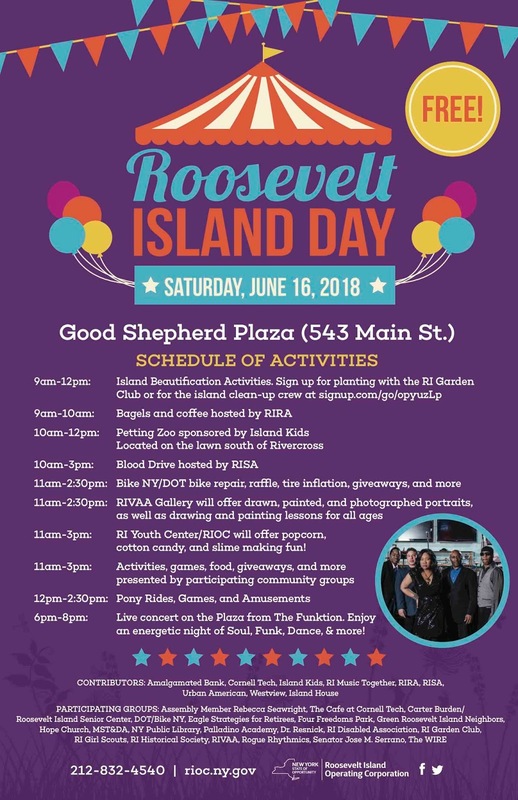 Due to Roosevelt Island Day activities this Saturday, June 16, there will be no street parking all day from 523 - 543 Main Street, 465 – 475 Main Street, and on the roadway adjacent to the Rivercross Lawn area near 501 Main Street. The Farmer's Market will be moved temporarily to the area just south of the Rivercross from Good Shepherd Plaza. that you can sign up for. that was scheduled to be finished this week. The Roosevelt Island Tram platform construction project’s completion has been delayed; by at least two weeks, due to recent wet weather. The Tram’s North cabin and both of its north platforms, at both Roosevelt Island and Midtown Manhattan, have been out of service since May 16 when the project began. The work was originally estimated to take 30 days to complete, but several days of heavy rain forced work, and ultimately project, delays. This new construction completes work that initially began July 2017 when RIOC contracted with Specialty Construction System, Inc. to address corrosion and water damage to both stations’ platforms at a cost of $2.15 million. The project includes the removal of the deteriorated top slabs, repairs to structural decks and main stanchions, removal of non-compliant ramps and the installation of a new ADA-compliant access ramp and rails on the north ramp of the Roosevelt Island Tram Station. New concrete wear slabs to the platforms at both stations, will be waterproofed and receive new traffic coating. The project products application is weather sensitive and went on hiatus in December 2017 until this recent past May when New York City area’s daily temperatures were forecast to be at or above those required. The MetroCard vending machines, previously located at the RI Tram Station, will be accessible once the platform work is finished. Until then, commuters are advised to buy a roundtrip ticket at the Midtown Manhattan Station or at the Roosevelt Island MTA subway station. The MTA’s F-Train, NYC Ferry and the Q-102 bus all remain as alternatives for commuters seeking other means of public transportation to the Island. As previously reported, the first phase of the Roosevelt Island Tram Platform Renovation Project began last July and was temporarily halted in December 2017 due to cold weather. Girl Scouts Headquarters of NYC is coming this Thursday (June 14th) for a FREE event for the community. All girls in pre-k or entering Kindergarten this September are invited. They have surprises for the girls and info for the parents. Doesn’t matter what school they go to. Is open to all!! 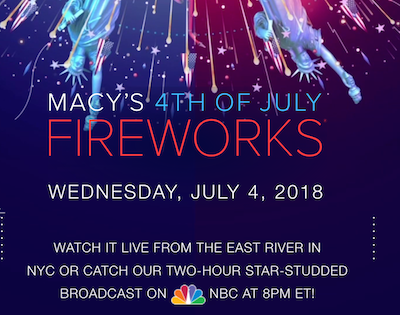 as the festivities take place for the fourth consecutive year on the East River. made available by the Roosevelt Island Operating Corp (RIOC). Last year, 2500 tickets were available for viewing the July 4 Fireworks at FDR 4 Freedoms and Southpoint Park. Advanced online registration was available for Roosevelt Island residents. But many residents were upset that tickets were sold out within a few minutes of becoming available or that they did not know about the advanced online ticket registration. Also, remaining unexplained by RIOC was why were there standby tickets available on July 4 when the advanced tickets were reportedly sold out. Will RIOC's July 4 ticketing process work better this year than in the past? The Roosevelt Island Residents Association (RIRA) Common Council discussed the July 4 Fireworks distribution system during their June 6 meeting urging RIOC to make known to residents as early as possible the process to get tickets. How and when will tickets be distributed. Will RI residents again be given early preference for obtaining tickets? The plan for the fireworks, tickets for the viewing area etc., will be available online. It is going to be released next week, once we get through RI Day. .... It's pretty clear that the Cornell Campus will remain open. Of course it's always subject to change if all of a sudden we have too many people and there is a public safety risk but the plan is to keep it open and most likely ticketing for Southpoint Park and 4 Freedoms Park as it has been in the past. This is all in the planning stage and when we have something more definitive, I will share it with you. Last Thursday I emailed president of RIOC Ms. Susan Rosenthal the responses I collected about families' frustration and requests about fireworks viewing, and on Friday I got to speak with her over the phone. She explained that they had to set up such procedure and number limit because Four Freedom Park is a state park, and they even tried to remove some waterside structures to maximize the number of people allowed in the park. She is sympathetic that not all who wished to go could, however they have to ensure the safety of all those who did get tickets, e.g. if any emergency happens, emergency vehicles should be able to move around easily, and/or people should be able to evacuate quickly enough. As to the online ticket claiming, they had an outside contributor to manage the process and she thinks that it is likely that a lot of people were getting it all at the same time in the first few minutes. Hope those Roosevelt Island residents who want July 4 Celebration Tickets are able to get them. 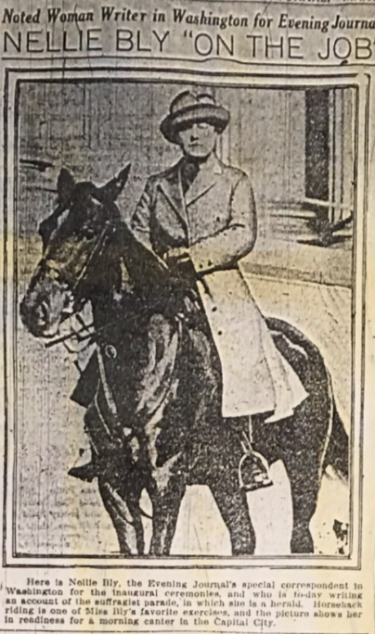 The Roosevelt Island Historical Society (RIHS) is hosting a free lecture about journalist Nelly Bly Thursday, June 14 (6:30 PM) at the Roosevelt Island Public Library (524 Main Street). Nelly Bly gained her reputation as a reporter when she exposed the horrible conditions of the asylum on Blackwell’s Island. Later in her career, she continued to cover issues of importance to women, including a seminal interview with Susan B. Anthony and major events in the suffrage campaign. New York University Professor Brooke Kroeger, whose biography of Bly is recognized as the definitive account of the reporter’s life, will speak on Nellie Bly: From Blackwell's Island to Well Beyond at a lecture presented by the Roosevelt Island Historical Society at the New York Public Library Branch on Roosevelt Island, on Thursday, June 14, 2018 at 6:30 p.m. The event is FREE and open to the public. It is the third in the Society’s annual series of spring lectures, which is supported by funds provided by Amalgamated Bank, Roosevelt Island Operating Corporation’s I Public Purpose Fund and New York City Council Member Ben Kallos, with funding from the New York City Department of Youth and Community Development. Here's more on the fascinating life of Nelly Bly. Would you like to work close to home on Roosevelt Island? Sodexo USA has a Linen Distribution position available at Roosevelt Island Coler Hospital. The position pays $17.88/hour, and our shifts are typically 7am -3:30pm, 7 days per week. Minimum of 20 hours per week. The position is a union based, front line role. All 3 of my current direct reports (currently Department Heads) were in the front line role prior to promotion--we really do look to promote from within. Please email your resume to Stephanie Mazlish and she will provide more info. The Sodexo web site also lists a position for a Patients Service Manager at Roosevelt Island's Coler Hospital. Requires the ability to successfully follow directions, work independently, and without Supervision. Must be able to push linen carts weighting up to 700 pounds. Must be able to work weekends, holidays and overtime (as required). Provides the highest quality of customer service at all times. Accurately inventories and distributes clean linen on all designated Units/Departments linen carts on schedule according to procedures. Records on daily inventory sheets the daily usage for each Units/Departments. Inspects clean linen for possible stains, rips, tears, or other unacceptable qualities before delivery. Empties and consolidates linen delivery carts at designated times throughout the day or as needed in order to provide empty carts for soil linen pick up. Collects soil linen in all designated Units/Departments on schedule according to procedures. Gathers Reject Linen at least once a week from all Units/Departments to be returned to the plant. Informs the Supervisor or Manager when inventory levels are inadequately high or low, when assignments are incomplete, or of any irregularities in service. Complies with all Safety rules and regulations. Must follow all company and regulatory policies. Must follow all verbal and written instructions given by Supervisor and/or Manager. No distasteful, derogatory, or racial paraphernalia to be posted or placed in the linen room. Learn about the foundational text in the Western literary tradition in this five part discussion group on Homer's Iliad. What is the Illiad really about? Watch video below and then go discuss at the Roosevelt Island Library Rad Illead Reading Group.